If you have trouble getting your teen to clean his room or sweep the kitchen, you're not alone. 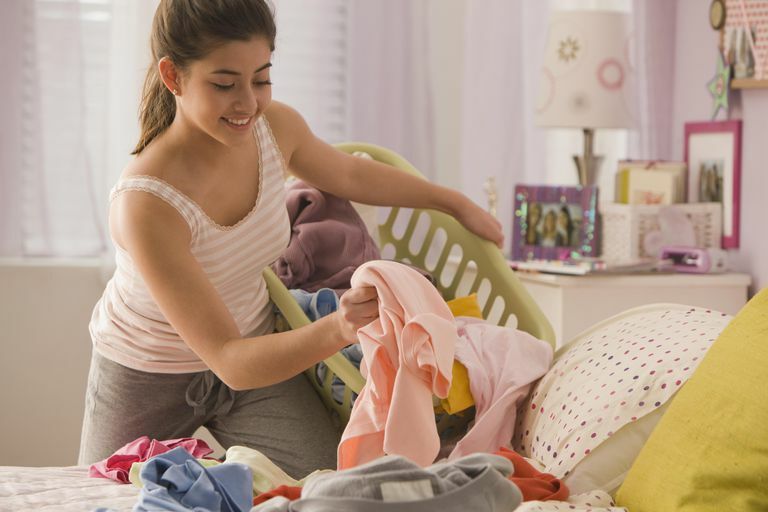 Most teens could find 101 things they'd rather do than chores. But chores are an important part of growing up. Kids who do chores grow up to become more responsible. Additionally, chores teach your teen valuable life skills. When he lives on his own, he's going to need to know how to maintain his home in a healthy, sanitary manner. There's also a good chance he'll live with a roommate or romantic partner someday. You don't want him to be a slob that no one wants to live with. But fighting, nagging, and begging your teen to chores, however, isn't a good idea. Rather than make your teen independent, you'll be teaching her to become dependent on reminders and motivators from you. Create a chore contract that will motivate your teen to do chores. Then, it will become her responsibility to do the work and if she doesn't, she'll know the consequences ahead of time. Rather than battle with your teen to do chores, create a clear written contract. A chore contract eliminates any confusion and makes your expectations crystal clear. When your teen signs a contract he won't be able to insist he 'didn't know' you meant he had to clean the garage. Instead, he'll know for sure what you were expecting. Outline which chores you expect your teen to do daily and which ones are weekly. Then, outline what will happen if your teen completes those chores, as well as the consequences of not completing them on time. The point of a chore contract should be to help your teen become more responsible. When he's signed the contract, and you've made your expectations clear, don't nag him or remind him to get his work done. Instead, follow through with the consequences that you've outlined. Think about what chores you want your child to do. Then, outline when you expect those chores to be done. I will keep my own areas picked up. This includes putting laundry in the hamper, hanging clean clothes in the closet, and putting books, sports equipment, and electronics in their appropriate spaces. I will keep my parents in the loop when a chore has become too complicated for me. If I can't do lift something because it's too heavy or I'm not sure how to do something safely, I'll tell you. I will take pride in my work so that the tasks or chores I have to do will be done to the best of my ability. I understand it's up to me to get my chores done on time. I won't expect you to remind me when to do them. I will talk to you if I'm having difficulty finding time to do my chores because of my homework or other responsibilities. My daily chores include picking up my room, emptying the dishwasher, and sweeping the kitchen floor. My weekly chores include mowing the lawn, cleaning the bathroom, and sweeping the garage. There should be positive consequences for getting chores done. A positive consequence might involve an allowance or privileges, such as spending time with friends. You can offer daily positive consequences, such as letting your teen use his electronics when his chores are done. Then, it's up to him to decide when he wants to do the work. Or, you can offer a weekly reward. That might include visiting with friends on Friday night if he's done his chores all week, or it might involve earning an allowance for getting his work done by Saturday at noon. If your teen is having trouble getting his chores done, take away his privileges. For example, tell him if he can't be responsible enough to put his laundry away, you're not going to trust him with the keys to the car. Or, tell him he can't go out with friends until he mows the lawn. Household Chores for Adolescents. HealthyChildren.org.​ Published November 21, 2015.